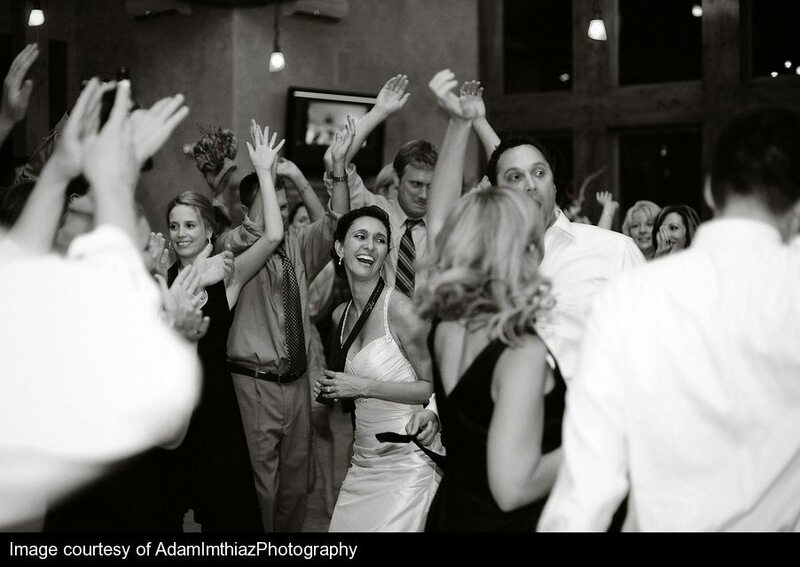 Rocking Wedding Party from Denver DJ Company A Music Plus! After all the decisions are made, the vows are said and dinner is served, usually the rest of the night depends upon the quality of the DJ or band. Great music means a party you’ll never forget, while bad music sends guests heading for the door. Don’t jeopardize your entire night by hiring your music based only on price – hire the best you can find. Most guests will arrive 20 – 30 minutes before your ceremony starts, but the wait will seem a lot longer if they have to sit in silence. Book your DJ or musician(s) for some elegant prelude music for a memorable start to your day. Many couples have no problem coming up with a list of a hundred (or more) songs or artists that they love – way more than can be played at your reception. But if you’re going to look back on your day and be bummed that you didn’t hear “your jam”, be sure your DJ or band knows about that song(s) that you simply must hear. By the same token, if there is a song or artist that you and your honey just can’t stand, be sure to speak up. It’s your day – no one should be cringing at their own wedding! You may have a highly evolved and eclectic understanding of “great” music, but you’re sharing this day with family and friends. Why not save your more obscure favorites for the honeymoon playlist and let your band or DJ play a mix of songs that everyone can enjoy? Seeing everyone have a great time will be worth enduring a few well-worn pop songs. Think about keeping it PG-13 during your reception. Your older relatives (and those with kids) will appreciate it. They know that you and your besties know how to party like rock stars. Why not go the classy route to start and get your freak on after the older folks and kids are safe in bed? Contact A Music Plus today for expert, professional help in helping you create the perfect music ambiance at your wedding!